Before we start: I know this title is quite the click-bait and comes off as inflammatory. it’s intentional. I’m not trying to call out specific individuals, I’m calling out everyone. I want to light a fire in every professional and aspiring commentator. Even further, I want to hold myself accountable too. Many things I am writing about even applies way more to myself than others. The things I bring up aren’t about everyone nor am I passive-aggressively saying someone should quit casting. These are my thoughts alone and this is my personal conviction. I watch a lot of hearthstone. I watch a loooooooooooooot of hearthstone. Sometimes in full screen with speakers on blast, sometimes on mute while I’m multitasking or between transfer flights at an airport. I also cast a ton of Hearthstone and at times, when the meta is figured out and stabilized, I feel like I can cast Hearthstone with my eyes closed. And truth be told, there have been moments were I feel like I have done events like that. I say the same things every time. I analyze the situations the same. Druid wants early ramp. Shaman is looking for the early board. Rogue wants the coin/spells. Freeze Mage mulligans for card draw and survival. Well, I guess he didn’t draw Reno Jackson. Turns out Fiery War Axe is pretty good! Lifetap is an amazing hero power. And while these things aren’t incorrect and quite important to mention, this is the limit of the depth we force upon the viewer. Another way to put it is that I feel like casters make Hearthstone sound less interesting than it is. We can do so much more. Casters are the only consistent entity at a Hearthstone event. The top 8 results and meta decks will always be shifting and rearranging, but the voices that guide us through the plays and stories are the same. In fact, due to how conversational Hearthstone is without a natural visual climax (nothing like defusing a bomb or a huge team fight), you might argue that good commentary in Hearthstone is more vital than any other eSport on Twitch these days. The fact that we can debate every single decision from card choices to lineup preparation to in-game plays makes this game extremely fun on a competitive level. There exists thousands of different outcomes and each of them are fascinating to discuss. As such, it’s no surprise we as a community tend to be brutally honest with our talent. While these days, the heckling is more of a meme fiesta more than actual outcry for action, it’s not really as evenly split as half-joking as one might think. Now there’s a lot of good things casters have done in recent times. I noted in my previous blog that positive energy goes a long way talking about the importance of finding the narrative, build up what’s happening on screen, and focus on the exciting things that are happening on screen. We’ve largely done this across the board and I feel like Hearthstone broadcasts has actually grown because of this trend. However, I think we’ve gone as far as this horse can go. It’s been mentioned countless times over the years: variety is the spice of life. If every caster sounds like this then not only will the voices drown on in a sea of monotonous praise, but it also makes all the casters collectively seem like actors. That they’re shills for Blizzard/Dreamhack/whoever else they represent. This shouldn’t be the case. Our talent pool is actually diverse should it should reflect that. So while we’ve done a lot of great stuff pushing things forward this far with Hearthstone commentary, let’s talk about the problem that’s starting to show in recent broadcasts. For one, it’s starting to get increasingly more difficult for casters to differentiate elite players in Hearthstone. This is because Hearthstone competitions are more open and growing with each season. HCT is the biggest tournament in the world and the amount of people fighting tooth-and-nail for ladder points and qualifying spots gets larger by the event. With so many new faces coming in and out, it’s getting increasingly harder to care which is why HCT works so tirelessly to do fun/memorable player profiles. Another aspect that coming into play is that casters have no statistics-driven narrative in Hearthstone. There’s no official rankings outside Gosugamers, but their system is imperfect and also lacks consistency. HCT points should be meaningful, but as far as I know, Blizzard does not wish to push elitism in Hearthstone through a ranking outside of legend finishes. We don’t have access to player profiles for win percentages or tendencies outside of what’s provided by Blizzard. I could talk about these problems more in depth but it’s starting to get off-topic. The reason why I bring it up is because these things all center around one glaring issue: it feels like players are having an even more difficult time setting themselves apart despite the ecosystem become more accessible. While casters can’t fix this problem singlehandedly, we contribute towards the difficulty of distinction. Our jobs at its core is to tell a story. Right now it’s not that interesting because of the way we tell it. I’m not nitpicking on the small details that Twitch chat picks on. Yes, sometimes we miss lethals, we read mana crystals incorrectly, and we sometimes even forget that the 2 cards of a deck were played already. All of these things are actually play-by-play moments if you think about it. That’s not lack of analysis, its lack of attention to whats happening on screen which will eternally be a problem in a game with so many numbers fluctuating simultaneously all over the screen while juggling dialogue with your co-caster/audience. That’s not what I’m talking about. It’s only human to error in this department. What I’m referring to is how casters need to step up their understanding of WHY things happen in Hearthstone. If you look at some of the biggest accolades given to an on-air talent, in sport or esport, one of the most appreciated attribute is the ability to dive into the mindset of a player. As casters, we’re resorting to generalizations of topics because we’re afraid to be wrong. We tend to stick to tried and true basic notions as opposed to understanding the intricacies of the game/series at hand. I used to think like this. Hell, this was the primary reason why I cast the way I do for years now and perhaps why many commentators have followed suit. I want Hearthstone to be accessible, welcoming, and most importantly, fun. But I don’t get why we as a community act like we can’t have it all. Does Hearthstone really need a play-by-play guy and an analysis guy like other games? 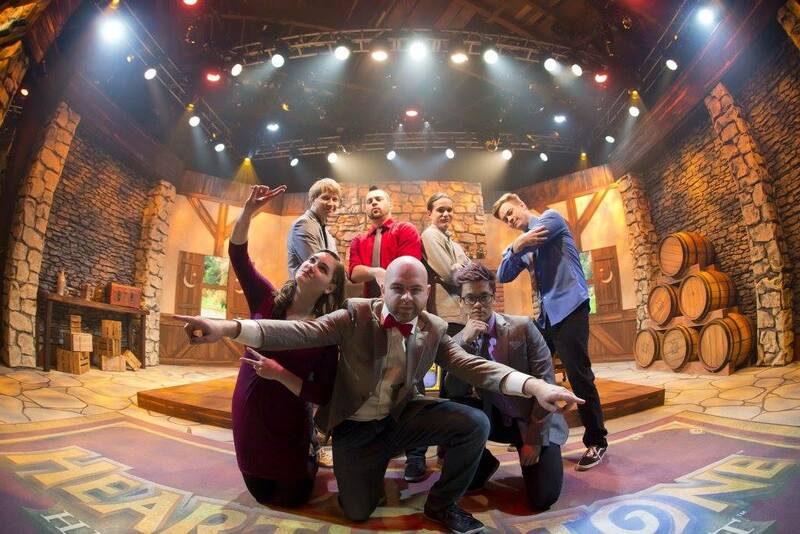 As mentioned in my previous Casting Call post, Hearthstone is very unique in the eSports broadcast space. Tournament setup, atmosphere, and pace is very different. There’s no obvious climax a lot of the time. Is there a particular reason why we need to explain what cards are hitting other cards? Part of what makes Hearthstone intrinsically fun to watch is that it’s easy and simple to grasp. A 2/3 visually bumps a 2/1 and survives with 1 health remaining. That makes logical sense. This is sort of two points in one, but they go hand-in-hand. A large reason why Hearthstone is as fun to watch is because we get access to full information and we can debate better plays until we are blue in the face. I would argue this is the most important thing about being a commentator in Hearthstone — the ability to help sift through what’s good and bad. Yes, bad. There’s a great video put out by Thorin who verbalized an important intellectual concept that “If everyone is good, no one is.” Take a moment to watch at least the first 3 minutes. It’s different with a game like Hearthstone because the card game variance does lend itself to having closer matchups which either player had a realistic chance to win. But this is not the point. As commentators, we are often trying to sell the players as being vaguely “great” and their plays are “excellent”. And by doing so, we actually cheapen the value of actual fantastic plays. Even more, we also make the result seem insignificant. Let’s boil it down in more simple terms. If no one ever makes a mistake in a game and it’s truly evenly matched, then luck plays a large factor. This applies to any game, but especially so in a game that has as much random outcomes as Hearthstone. Thus, if we make it seem like players are on the same level and their plays are always good, then what is the audience led to believe? That one player got luckier than the other. No matter how salty players lead you to believe, the truth is that there are tiers of players who are playing at a significantly higher level than your average legend player. In fact, it tends to benefit the elite into convincing the majority that skill doesn’t truly matter at the top. Thus, they remain in the top strata by allowing others to think that, similar to Poker. So it’s important the caster can feel like he can explore discussing things in the truth. Player A played badly. Player B played okay, but since he outplayed Player A he still won. By saying both players did equally well, we de-legitimize the series as well as the game/tournament itself. However, there comes associated risks with it. First, the audience doesn’t like to hear excessive negativity, especially with someone who has power over the microphone. It sounds condescending, arrogant, and that constant criticism can feel like a mood killer. This is exacerbated when a popular player comes onto camera since many of his/her fans will rally behind them. But I think that players need to be more open-minded as well. Many of them are as oftentimes you hear in interviews “Man I played like crap” or “That was so sloppy and I’m unhappy with how I played.” Why are the commentators unable to say this? Because we fear the inevitable battle that we have to struggle with once we declare war on someone’s play. It’s not that it will happen every time, but even one time where it goes disastrously may leave a bad mark on the caster’s reputation and relationships, which may have damaging effects further on. However, there’s a simple solution I feel that ties in all 3 points. Credibility goes a long, long way in Hearthstone, a game of opinions. And simply put, when you get an opinion from an unreliable source, you kind of want a second opinion. I don’t find it a surprise that people really enjoy commentary from Savjz, Brian Kibler, Reynad, and most recently Firebat. What do they all have in common? They actually have history to back up their words from strong ladder/tournament results. All have finished top legend and placed high in events before. So when they discuss a match up or a decision tree, you feel like it makes more sense since they’ve done it before. It doesn’t mean they are always right in their analysis. Actually, they’re arguably wrong many times and they readily admit it. But their words carry weight. More importantly, other players trust them to be able to see their perspective and reasoning behind decisions because they’ve been there before. So to follow up on the previous section, how do we go about bringing analytical criticism to games? I think the key is hiring casters that have a good reputation and can eloquently break down the who, what, and why. That’s why I personally have been striving to get top 100 each season. That’s why we need to appreciate guys who are putting in the time to do so such as TJ Sanders (Top 25 NA June 2016) and Raven (Open cup grinder, Most HCT points out of any caster iirc). I’m not saying this to cement the existing group of casters and deny entry of new talent. In fact, this should be encouragement to any aspiring commentators to git gud to get noticed. The old timers need to keep up as well. As much as I love Kibler and that this post doesn’t really apply much to him, he still needs to actually sit down and grind freeze mage games to understand this insanely complex deck. Savjz is a fantastic analyst, but he hasn’t played a serious game of Hearthstone in months and would be better prepared if he took time playing some meta decks. Reynad regularly admits he’s falling more behind the meta and is in a constant state of playing catchup. The cream of our crop can improve. We all can. Hearthstone is a card game that doesn’t require intensive mechanics or fast reaction time unless you count the days of OG Patron Warrior. Outside of crippling healthy problems (anxiety, for example), there is literally no excuse for people who call themselves professional Hearthstone casters to assert themselves with some results on ladder or in tournament. I feel like this post was probably a bit too brutal and no doubt some people mentioned or implied will message me privately/publicly to explain why I am right or wrong. This post is supposed to serve as an example in itself. Similarly to how I attempted to dissect Hearthstone’s current commentary trends in 2500 words or so, perhaps we should also try exploring Hearthstone plays more honestly with vibrant discussions. After all, we are there to entertain you guys. Hopefully with less than 2500 words. But don’t put your money on it. I’m a Talkstone caster. This entry was posted in Casting Call: Caster Fundamentals and tagged analysis, avocado, broadcast, casting, commentary, firebat, frodan, game knowledge, HCT, hearthstone, Hearthstone Championship Tour, kibler, kolento, personality, reynad, savjz, strifecro, talent on July 3, 2016 by frodan. Kibler, Reynad, and Savjz took to casting because it allowed them to quit the game of Hearthstone while still making money off Hearthstone. I’m sure most people would love the cushy casting or streaming life compared to grinding ladder and open tournaments making almost no money. Savjz, Kibler, and Reynad, have very few accomplishments on ladder and “Open” tournaments compared to many “semi” pros and are fortunate to have successful stream careers which allow them to make money off the game but not actually have to play it competitively. I can name 100 players with more top 100 ladder finishes than them who you’ve probably never heard of. The fact that people have to constantly justify Hearthstone as a skill intensive has to make the common player wonder. I don’t think is a good idea to focus on ladder results. Probably it’s even detrimental. I think ladder and tournaments are completely different things. On ladder currently you only care about doing good against warrior and shaman. On a tournament you can ban one of those and let the other win or tech against it so they can’t win with it, the strategies and deck building change a lot. Hearthstone casting is mostly tournaments, not ladder. Hence ladder knowledge can lead to wrong assumptions and bad commentary. Playing ladder might be more casually accessible but I think is more important to focus on playing tournaments or practice games. Not sure how Reynad looks at things now, but I know both Kibler and Savjz just prefer to play in a different way. Kibler loves playing Dragon decks, loves playing insane combo grind matches. He plays decks that most don’t play, yet gets Legend with it. He plays for fun. The same can be said for Savjz ever since he stopped being a pro player. I saw him playing fun decks regularly, using cards like Majordomo because he enjoyed it. Being a pro player is a lot of work and more importantly, it takes out some of the fun, because if you want to get those points, want to get good with decks that are at the very top, it means you have to play with decks that don’t feel original or fun most of the time. Playing Dragon Warrior while disliking both Dragons and Warrior, is just no fun, but if it gets you to the top, what do you do? And then there is the time element. I’ve been playing since beta, I’ve never gotten higher than rank 4, mind you I reached that rank with over 60% winrate, if I would enjoy playing all day, I would have gotten Legend plenty of times, but I don’t enjoy that, I enjoy a couple of games per day, yet this is what you have to do to get to the top. There are plenty of streamers right now that would love to take their viewership to another game, not exclusively, but reduce the amount of hours they put in the game, while still doing their thing on stream, and that’s exactly what some of these players have done. You still see them streaming at times, enjoying the game, creating fun decks and of course cast games, which allows them take all the parts of HS that they enjoy, and remove the endless grinding and training to stay in the pro scene. I for one can definitely understand their choice and I’m happy that it worked out for some of them. We lost some great personalities because they lost their interest in playing the game competitively themselves, and now we can see them enjoying themselves, whether they are streaming or casting. @Frodan thanks for this insightful piece, I really enjoyed reading it and I hope you guys can build further on this. I definitely hope that the fear of being wrong can disappear. Simple fact is, as you no doubt know, that HS has endless possibilities, that based on information, tactics and chances to win, people can make all sorts of decisions, sometimes they are better than others, but a good play can loose you the game, while a bad play can win you the game. Casters should not be afraid to voice what they would do, Twitch chat will act idiotic, but they will do that regardless. I would rather hear all your thoughts about what you would do and discuss that, than all be agreement that what they player did is probably the best choice. Also what is your experience with 3 casters, where 1 really focusses on the game and not the chatting the other 2 do? Well written, well illustrated and bold. Thanks for this. I really like that you are constantly striving to get better at what you do, and you are not afraid to criticise yourself and some aspects of the status quo in general, in order to keep the discussion alive on it in order to improve it. It’s true there are some issues, and I’m glad to see you are not a “let sleeping dogs lie” person at all. “The audience doesn’t like to hear excessive negativity, especially with someone who has power over the microphone. It sounds condescending, arrogant, and that constant criticism can feel like a mood killer. This is exacerbated when a popular player comes onto camera since many of his/her fans will rally behind them.” This is of course true, and has been seen quite a few times (not recently). But a balance must be found between a more active commentary and the very politically correct one that we usually see. I feel the casters and Blizzard need to get a bit outside their comfort zone regarding HS. I understand why they are doing this – mostly because they want to appeal to as many viewers and players as possible, while also creating as little tension as possible. It’s safe, but it can quickly get boring. We need better, more interesting and less “safe” feedback from the casters and also from the game’s design team, according to the actual info (or lack thereof) that you see in their interviews. Another thing to remember is that while I appreciate the effort to keep pointing out alternative plays instead of immediately spotting a mistake or the poor potential outcome of a move, this also clutters up the commentary a lot. Short and sweet is better. As someone who played Hearthstone since Beta, I only really started to understand the efficiency of trading and developing my weapons early because I watched tournaments and streams. Now with all of that knowledge of two years behind me, I can understand what is happening on the board and why the players are making the decisions they choose to do. However, there are new players to Hearthstone every year and they may not understand what is happening and I feel as if the casters need to keep that in mind. You bring up some solid points Froden, but slack off on backing up your ideas on several fronts. When you say in your essay “Druid wants early ramp. Shaman is looking for the early board. Rogue wants the coin/spells. Freeze Mage mulligans for card draw and survival. Well, I guess he didn’t draw Reno Jackson. Turns out Fiery War Axe is pretty good! Lifetap is an amazing hero power” a veteran player understands, but you failed to provide concrete examples of how to fix those specific issues. If you’re going to call out those details that need to be addressed, you should also give examples of how they can be improved. I watch a lot of Heroes of the Storm and there is a caster called Dreadnaught (formally of Tempo Storm, perhaps you’ve heard of him? 🙂 ) and the community respects him so much because, like you said in your article he has “been there done that.” He and the majority of the Heroes casting community have no problem saying “that was a bad decision on the part of Cloud 9 taking that engage.” So Frodan, ask yourself, why in Heroes, Sc2, LoL, Dota is it okay for the casters to criticize the plays but not Hearthstone? What makes the atmosphere different? Gillyweed, also a Heroes of the Storm caster recognized that the community needed stats and a story line for audience which was not going to be provided by Blizzard so she started to do her own research and her own interviews prior to tournaments. She is now known as the hardest working caster in all of Heroes. She knows each player very well, and she could probably name all of their pets, their parents names and their siblings, that is how much research she does. Gilly researches most hero played for each person, if they actually likes that hero, and so much more. But most importantly, she also gets to know the players on more of a human level to develop the stories for the cast, like you discussed in your essay. Relying on outside webpages is a cop-out. There is more to casting than “googling” stats. Now, this is just a personal pet peeve of mine, never apologize for your thoughts like you did in your first closing paragraph. You have a right to say what you did and you’ve earned your stripes. I agree with most of your points. The only caster I have seen who has been very quick to “figure out why” players do the things they do in high level matches, is rdu. Top pro players would make for the best analytical casters, but they REALLY need to practice casting too. In Heroes of the Storm we had the same problem, with only a couple of casters actually having good, analytical knowledge (Khaldor and Grubby), but then Dreadnaught started casting with AMAZING analytics, and then he got better at casting and now the state of hots casting is pretty good. Statistics should only matter for Blizzard sanctioned events. Anything outside of their territory should be null and void. It shouldn’t matter how many times a pro cashes in in an invite-only tournament because other players never had that chance. Those results do matter, and they report them for poker. Just because you or I or some other random pleb can’t be there doesn’t invalidate their success or earnings at that event. The criticism brought up here feels like it really did need to be said and their is no one better than you to do it. It is painfully obvious how many of the casters have never even played many of the top tier decks let alone at a high level and it is fairly easy to get buy a hearthstone cast simply by reflecting on plays after the fact and relying on general knowledge. Personally my favourite caster is Sottle since he often disagrees with lines of play made by the players and proposes an alternative rather that stating ” this play is good because ____”. My biggest concern with Hearthstone casing really does come down to one thing you touched on which is variety. Other than yourself and songbird, every caster for blizzard events and even for most non-blizzard events happens to be a white male. As a minority this is something that has always bothered me greatly as I am sure their are many talented casters who do not fit into this category and would love to see some ethnic diversity in casting as well. And the reason why you are the best, is because you are always challenging yourself to be better. Well said, and needed to be said. Some good comments here too. I’m just glad someone as likable and intelligent as you is trying to tackle this, as you are uniquely qualified to have a voice here. And I love the picture of all the casters, Your pose just screams “pensive gurgitation” – and that’s probably not a line that’s ever been written about anyone, ever! […]However, there comes associated risks with it. First, the audience doesn’t like to hear excessive negativity, especially with someone who has power over the microphone. It sounds condescending, arrogant, and that constant criticism can feel like a mood killer. This is exacerbated when a popular player comes onto camera since many of his/her fans will rally behind them. The thing is, it’s true for p.c. in general. A lot of people will demand objectivity, but then punish for being objective. If one wants to say something negative, he needs even bigger diplomacy skill than his balls.